Despite its overarching glitz and glamour, the audience of Hindi films are not carried away by such superficial floss in movies. And the first quarter (Jan-March 2015) result from the box office is an ample testimony to the fact that the discerning movie-goers are not ready to spend their money in watching these masala stuff due to poor content and lack of original attempts in the silver screen being dished out to them. In the first three months of 2015, 33 films have been released , but only 2-3 movies will be able to fully recover the cost of production. Badlapur and Dum Laga Ke Haisha are the clear winners with latter even going to make a slight profit. However, NH10 has got rave reviews and might it just get back its money from non-theatrical earnings. The irony is that Baby which netted the maximum of Rs 96 crore may still end up losing because of its high budget value of Rs 80 crore. In the losers category are Tevar, Dolly Ki Doli, Hawaizaada, Shamitabh and Roy. In fact, the Bollywood scenario is turning from bad to worse as the first quarter results are quite shocking and offers a stern lesson to filmmakers and directors with a suggestion to ‘mend ways or else.’ What is most depressing in this year so far is that there is not even a regional language film that can be shown as model cinema for the makers of Hindi movies. One can’t take the box office reports coming out of production houses, publications and trade at face value as their facts and statistics have to vetted with a fine lens to extract the real story behind the fate of each movie. A movie analyst will know that there are vested lobbies in trade and media to shore up the image of a dud film with the motive of make a last ditch attempt to improve its earnings. A lot of needless hype and publicity surround the release of a film in order to cash in on weekend collections. There will always be confusion over gross earnings, return on investment, production cost, non-theatrical income and overseas collections. These figures will be quoted at exaggerated levels to fool those who are not conversant with the knack of film trade. Some production companies host a number of gala parties and issue press releases to crow about the success of their films as part of a well-thought out marketing strategy. All said and done, time has come to seriously ponder why the movie-goers are staying away from cinema halls like never before? Unlike in the past where 7 out of 10 films were in the plus to super hit range, filmmakers today have forgotten that watching a movie is still being considered a fun-filled family experience. At present, there is mad scramble over mass and class films and the issue of striking a balance between box office earnings and winning critical acclaim are foremost in the minds of producers. Whereas in the past, the focus has been on narrating a clean and interesting story with characters suited to the main plot that attracted a large number of movie goers in the Hindi heartland. Despite the onrush of digital technology and high-tech cameras, the basics of filmmaking remain the same in India. The new breed of filmmakers with exposure to latest Hollywood flicks and possessing a high-value degree on cinema from western institutions have misjudged the pulse of the audience. The producers have well etched notions of what constitutes a mass, commercial film and an offbeat, arty film. But they miss the point that even lay man will be able to appreciate a non-commercial film if it is narrated in an intelligent manner. Another fallacy in film circuits is that a new release will be a box office hit if it gets positive reviews from print and other media. What the trade and producers don’t understand is that only houseful shows in A, B and C centres in the first 2-3 weeks will earn a film the stamp of ‘box office hit’ and no other body or individuals can judge the result of the movie before that. To cut it short, moviegoers want value for their money. And for that filmmakers have to exhibit movies that are fresh and different in content with an interesting narration that is able to pin down the audience to their seats till the end when the credits roll by on the big screen. 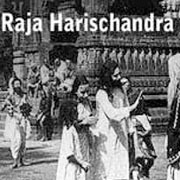 Indian cinema made its debut with the silent film Raja Harishchandra, way back in 1913. The pioneering filmmaker Dadasaheb Phalke had to undergo many obstacles and personal setbacks before his creation could see the light of the day. The first movie mogul went on to produce 23 films between 1913 and 1918. But unlike the robust growth of Hollywood in early 1920s, the film production in India was rather slow and in some periods it was in fits and starts. The early 1920s saw the rise of several new production companies, and most films made during this era were either mythological or historical in nature. Hollywood films caught the imagination of Indian audience who were overawed by action flicks which involved dare-devil stunt sequences and larger-than-life characters. Soon Indian producers began to follow the style and technique of Hollywood filmmakers to capture to the growing domestic market. However, filmed versions of episodes from classics such as the Ramayana and the Mahabharata still dominated this decade for mythological themes found in niche in audience’s taste as they are deeply rooted in the religious psyche of the common man. The prominent filmmakers of 1920s were V. Shantaram, Ardershir Irani, Baburao Painter, Chandulal Shah and Suket Singh. Some of the noted films produced are Painter's Maya Bazaar (1923), Irani's Anarkali (1928) and Shantaram's Gopal Krishna. Fatima Begum who is considered as the first female filmmaker made Bulbul-e-Parastan in 1926. The first international co-production was with Italy for Nala Damayanti in 1921. The first talkie Alam Ara (1931) made people spellbound and this movie a big push to Indian cinema still taking baby steps. The number of production companies rose exponentially and the number of films made each year too began to rise steeply from 108 in 1927 to 328 to 1931. 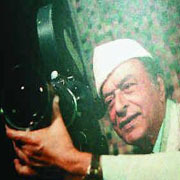 Colour films were imported and animation too pepped up Hindi films which further vetted the appetite of Indian masses. Social issues like women’s emancipation took centre stage and V. Shantaram's 1936 film Amar Jyothi was the earliest film to throw light on a number of hurdles being encountered by women of that era. In the 1930s, actress Devika Rani captured the hearts of movie buffs with sterling performances. The other female artistes were Durga Khote and Nadia. 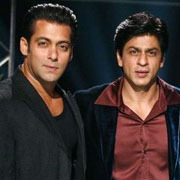 Homi Wadia and J.B.H. Wadia were the pioneers of stunt movies with Hunterwali and they were followed by Ashok Kumar, Prithviraj Kapoor, P. C. Barua and K.L. Saigal. 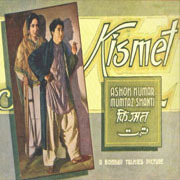 Ashok Kumar starrer Kismet (1943) written and directed by Gyan Mukherjee and produced b y Bombay Talkies has for the first time took on a bold theme of an anti-hero character and an unmarried girl getting pregnant. This is the first double-role subjected played by an Indian actor. Around Independence time (1947), Hindi cinema went through a metamorphosis out of which the modern Indian film was born. In 1947 alone, over 100 Hindi films were released and Mehboob’s Aurat (original version of Mother India) was also released during this decade. The historical and mythological stories of the past were now being replaced by social-reformist films, which turned an often critical eye on such social practices as the dowry system, polygamy and prostitution. 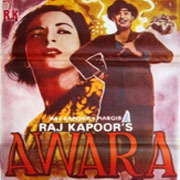 Raj Kapoor's 1951 film Awaara is known for the chemistry between him and co-star Nargis. The film's dialogues, photography, songs and extraordinary dream sequence were its strength. It remains one of the most popular classics in Indian cinematic history of the '50s which was considered the golden age of Hindi filmdom with other classics like Mehboob Khan's Mother India and V. Shantaram's Do Aankhen Barah Haath - both in 1957. The 1950s saw filmmakers such as Bimal Roy and Satyajit Ray focusing on the lives of the lower classes, who until then were mostly ignored as subjects, and drew movie goers on a range of social themes that reflected the contemporary Indian society and attitudes. This decade heralded the golden era of Indian cinema. Mughal-e-Azam, one of the biggest and lavish Indian films, took nearly a decade to make and was released in 1960. Many stars like Dev Anand, Mala Sinha and Sharmila Tagore shone brightly in this period of evolution of Hindi cinema. A series of social and political upheavals, besides great changes in movie making in the US and Europe, galvanised Bollywood into new heights. Thus New Wave cinema was born with directors like Ray, Mrinal Sen and Ritwik Ghatak exploring a range of human emotions and sentimentalities. With focus on realism, these directors saw the travails and tribulations of common man as film subjects and went on to make movies that the audience can compare themselves with, instead of purveying an escapist gimmicks. Who can forget Sholay released on August 15, 1975. 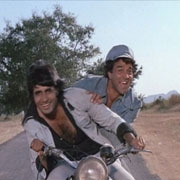 Ramesh Sippy’s film catapulted lead pair Amitabh Bachchan and Dharmendra to sizzling heights. Presented in the 70mm widescreen format and a stereophonic soundtrack, the film has a timeless appeal to movie-goers across the country. With the gradual exit of Rajesh Khanna as mass icon, the screen has got a new hero Amitabh Bachchan, the angry young man, who reached superstardom at the end of 1970s with a series of commercial potboilers. From southern sizzler to Bollywood heartthrob, Sridevi had come a long way and she ruled the Hindi films with a romantic roles and cherubic face throughout the 1980s. Films like Naagin (1986) and Chaalbaaz (1989) won her praise for her acting talent and she ruled the chart as the top heroine with none to be compared with. Her ability to don versatile roles drew a large number of audience to movie halls. In the latter half of ‘80s, Madhuri Dixit joined the race. Her films Tezaab (1988) and Ram Lakhan (1989) ran to packed houses. Shah Rukh Khan stormed the tinsel world and reigned the film industry like a colossus throughout the 1990s and most of his films, turned to be chartbusters with collections ringing at the box office. 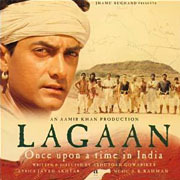 The dawn of 21st Century saw the popularity of Bollywood climb higher with Aamir Khan’s Lagaan making its way into Oscar nominations. A number of sleek films were made with modern techniques in cinematography and novel ways of telling stories that made watching cinema a refreshing experience. Also, special effects and animation emerged as important tools to enhance the viewing experience of the audience always look for something above the ordinary stuff in each film to make it a memorable one. Salman Khan is Salman Khan no replacement for him. His mind boggling stunt scenes and timing sense have lead the audience to jump, clap and whistle hysterically. He is the one actor who commands repeat audience who are crazy about his acting skills. His film Dabangg was a huge hit and raked in the moolah like a torrent at the box office. His films Ek Tha Tiger and Dabangg 2 followed the predictable lines, but further cemented the place of Salman Khan as the lucky mascot of the Bollywood. Only Sallu can give consecutive hit films without a break and producers just love to wait for him to take up their projects to strike gold at the box office. Despite some good Hindi films making global impact, the industry still rides on star power for its success. The hot mix of action, romance, comedy and peppy music is still the most reliable and safe model for raking money at the box office. But now and then, there are emerges some meaningful films with novel plots, clean narration and well-sketched characters that pull movie-goers to gravitate towards realistic views of the world. Oscar-winning Slumdog Millionaire and a spate of Hollywood technicians arriving to work in Indian films have given a new thrust to Hindi cinema. Besides, the infusion of foreign capital in Bollywood and efforts to corporatise the art of filmmaking into a commercial venture have added a new chapter to the business of financing films. As the film industry grapples with high cost of production and low revenues, there are concerted efforts now by production houses and studios to adopt innovative ways to strictly put a lid on spiralling cost of actors' salaries and marketing of movies post-production. Senior managers of top 10 Indian studios met at an office of Karan Johar's Dharma Productions in Mumbai in April 2015 to deliberate on how to resurrect the Bollywood industry valued at Rs 12,640 crore and of late, facing an existential crisis. They decided to cut down on marketing spends, clamp down on outdoor media publicity, limiting the full page ads and TV promos and also shorten the pre-release publicity from six weeks to four weeks to trim the overall expenditure as margins are being squeezed beyond the threshold limit. Ever since Bollywood started corporatising its work culture in early 2000, the most active film industry in the world has faced big crisis four times, but this time they are reacting in a calm and composed manner with a lot of planning. Now, both the studios and production houses who were at loggerheads at each other and in tough battle to win film projects have come together and chart out remedial measures to create a strong and profitable Bollywood. The Hindi film remained stagnant in 2014. Top grossers likes Jai Ho and PK were bought out by television buyers for a pittance. Out of the top 20 films released in 2014, only 4 made a good profit, said one conservative estimate. Another worrying aspect is the steady decline in the amount broadcasters paid for airing films as TV channels are focusing more on sports and entertainment programmes to fill their prime time slots. TV rights can fetch just 12-15 percent of total production cost of a film, but if the cost goes up then, broadcasters would not be able to bridge the price gap due to various factors. Star India, one of the biggest bidders for film rights, is focused on sports and entertainment as there is a decline in the time spent on watching films from 20 to 18 per cent. The 12-minute cap on advertisements makes monetisation tougher and hence, many broadcasters settle for cheaper dubbed regional films. India has just 10 movie screens per million people (screen density) whereas in the US it is 125. To this, add the stagnation in the box-office. This is a function of India's abysmal 10 screens per million people screen density (the US is at 125). Just 5 years back, China had roughly the same number of screens as India. But in the past few years, that country has worked hard to push the number of screens to 24 per million which has taken it to $4.8 billion in total box office revenues as against India's $1.7 billion. Purely on box office collections, China stands now as the second largest film market in the world (after the US), though it does not have a vibrant industry like Bollywood. This only goes to show that screen infrastructure plays a critical role for the growth of ticket sales and prices for the local film industry. According to trade pundits, India needs a strong policy to boost the growth of screen infrastructure which can be accomplished only with investment from the government to attract ultra-modern technologies for cinema. Moreover, there is a strong favour to simplify the many variations in entertainment tax under the goods and service tax to clear the lingering doubts and mistrust over this levy. Only in India, the talent cost (salaries for actors, technicians) consumes 40 percent of the film's budget, whereas in other countries it won't exceed 20 percent. Besides, marketing costs have jumped to 30-40 percent of the budget from 15-20 percent five years ago. 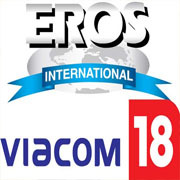 When they arrived in India, most of the studios like Disney, Fox and Eros had to compete with each other to bag film projects which led to the present stalemate of huge rise in the cost of production. Now, they have decided to come together to bring down the cost and correct the anomaly. studios are increasingly signing up with young and upcoming stars who are ready to accept a share in profits instead of taking an advance fee which will reduce talent cost. Moreover, young actors are being booked for bulk deals by studios which will have cost advantage. Finally, transparency on box office collections and more screens are important link chains if production cost has to come down in Bollywood. Besides, the average prices of movie tickets have to keep rising to benefit production houses. However, Bollywood is on the cusp of a big change once digital media starts penetrating the country and they will be able to pay higher prices for movies. The TV channels will then negotiate for all rights from the filmmakers and studios. A consolidation of film business is bound to happen with TV channels becoming film companies like in the United States where the biggest studios are owned by those in the business of running TV stations like Disney, Time-Warner, Viacom and 21st Century Fox. Once Indian studios begin to run both TV channels and take care of film production, then global market opens for them to acquire businesses abroad.